Firstly, we have no photo of the house. The attached drawing has appeared in several publications. We'll run down its source. The house was put together by material brought over by the Cape Ann party. With such a small crew, there would have been room for a lot of material on the boat. We might say that this is the house that Thomas built. Evidently, the building job was completed in 1624. Possibly, that would have allowed some shelter for their first winter. Who lived in the house? One researcher suggested that the overseers used the house. Tilly didn't have a family. Did other families share the warmer space over that first winter? We need to pull together all of the stories that have been told over the years. Of course, we can say this is the house that Roger Conant took over with his coming into leadership at Cape Ann, in 1625, after his sojourn in Plymouth and Nantasket. 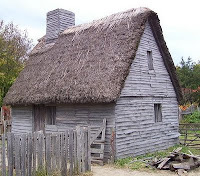 Too, we can say that this is the house that John Endicott had taken over to Salem for his use. See Higginson's description of Salem including the 'fair house' for the governor. Obviously, it was the first 3-story house in New England, perhaps even in the eastern U.S. Before saying that, we would have to look at what the Spanish did in Florida. Jamestown put more into their fort than the houses. Of course, what did the other houses that use locally fabricated material look like? And, to what did Thomas and Margaret move when Conant 'confiscated' the house? We can surmise the construction style by comparing the Thomas house with the one (shown below) of George Soule (a re-creation) which illustrates both the material and the construction technique. A little later, there would have been houses like we see with Balch (Beverly) and Whipple (Ipswich). By 1626, the crew was on the move to what became Salem. Did they leave anyone behind in Cape Ann? The house was not moved until later; was it occupied during that time? We know its location in Salem after the move. What eventually became of the house? Finally, let's look at some of the economic realities, that will be addressed more fully, here and elsewhere, until we get the real story out there about Thomas and his kind (the real contributors). The crew came into the area in the spring. Given that planting requires preparation, was there really enough time to do anything (even if there were good ground) that first year beyond sustenance? Hint: did not the group sustain itself? We did not hear of food problems of a major sort until the mass influx later that overwhelmed the supply. The house took some of the effort from the crew. Even if all of the material was there, construction takes time, energy, and knowledge. Did this diversion impact fishing efforts, to boot? Again, the sustenance issue comes to fore. I have said elsewhere that 'capital' was asking for its profit before giving enough time to the planters. Given what we know now about start up costs, were they not underestimated for this effort (or was the presence of the Church mindset necessarily associated with over-optimistic views -- of course, selling one's nephew down the river seemed to fit well that Church-obsessed mind)? One can also imagine all of the logistical nightmares? Just because this group was better prepared than their neighbors to the south did not lessen the difficulties that those who came over faced. Asking for unreasonable profits still exists today (why else the impetus behind globalization -- and leaning, that is, push costs to your suppliers while not listening to their pangs as you squeeze out their blood); at this time, it would have been worse due to the nature of that aristocratic bent that had God's approval (Church, again, supposedly). Of course, we know that Roger was no more capable than Thomas. How did those two relate (their offspring married, we'll get into that)? It is interesting that Roger, and his Old Planters, went off to what is now Beverly. Thomas and Margaret were still very much part of Salem (we'll put out, soon, a post on their 1641 location). As said before, Thomas' offspring are strong evidence for him and Margaret. We'll detail each more fully. Too, he was referenced as 'Mr' and performed a whole lot of civic duty. Some have gone on about Roger's grace as he yielded to John (the Endicott, of course) for the greater good. Thomas, too, was graceful, in many more ways (we'll have to tell this tale -- essentially stayed well enough under the radar for all of his offspring to become effective adults). That these economics considerations are pertinent in today's world seems to increase their potential interest. 01/25/2013 -- By the way, we're going to document this more thoroughly on Wikipedia - Great House (Cape Ann). We have John Goff's expertise available to assist us. This house was the first of its kind in New England. 10/28/2012 -- September issue had a theme of houses. 05/01/2012 -- There will be a 'house' category, soon. Too, house is mentioned in the Maypole post. 12/17/2011 -- Tim Lambert's A World History Encyclopedia will be used much in this blog and in related material. Here is his description of colonial homes. By the way, we'll look at this, too. In Connecticut, where the cast offs (kidding) from Winthrop's world went, in part, they started to build big houses early. As in, the prototype for the American Mansion (and the McMansions) was worked right there south of Massachusetts. What was different? Multiple fireplaces, many rooms, large square feet, multiple cooking areas, servant quarters, and so forth. 12/02/2011 -- According to Felt, in the Annals of Salem, Endicott purchased, when he arrive, the house and have it moved from Cape Ann. Felt writes "It was then two stories high. Some of the remains of it are said to be still contained in the Old Tavern, at the corner of Court and Church Streets." Felt also mentions the reference to the house made by Higginson ("we found a faire house newly built for the Governor") when he arrived in Salem. 10/13/2011 -- Er, Margaret's house. 08/21/2011 -- Going through White's Plea may take some time. See Remarks 08/21/2o11. 08/16/2011 -- We will be using the Planters' Plea (from White) to get some better sense of what happened in that early period. Only Endicott is mentioned by name.